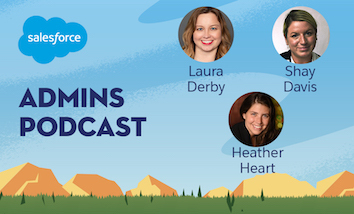 Today on the Salesforce Admins Podcast we have the second half of our live taping from Dreamforce. 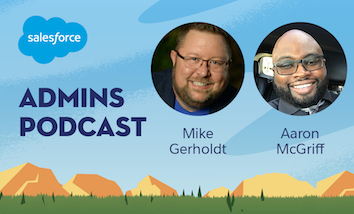 We have Aaron McGriff, Salesforce Business Systems Analyst at Masco Cabinetry in Detroit, and we’re joined by the original Button Click Admin himself, Mike Gerholdt. 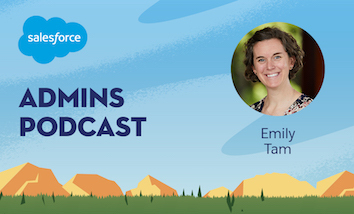 Join us as we talk about the differences in their experiences as someone who’s just learned Salesforce and someone who’s been with the platform for over a decade, and stick around for a special community Lightning Round. You should subscribe for the full episode, but here are a few takeaways from our conversation with Aaron McGriff and Mike Gerholdt. Mike started using Salesforce in 2006, while Aaron has only been on the platform for a year. With the contrast in experience on the stage, we wanted to hear what the hardest thing was for Mike about learning to be an admin. “The biggest thing I struggled with was understanding how data relates to other data,” Mike says, “understanding how objects relate to other objects and how they link together just never made sense.” One day, he took a class with Salesforce instructor Wendy Braid that clarified everything. She drew a diagram on the whiteboard visually relating records and identifiers, and suddenly it all made sense. 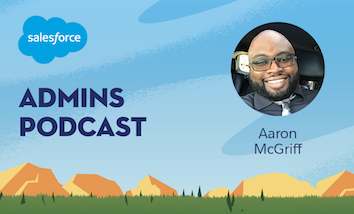 “A lot of my friends are finding out that I’m a Salesforce admin now,” Aaron says, “and I didn’t realize how many of them use Salesforce for their jobs.” Even though he’s relatively new to the platform, he’s been able to use his knowledge to teach others. One of his friends needed to create a bunch of reports but she had no idea how to do it, so she came over and he was able to show her the ropes. How to jump in with the community. “Volunteering is one of the best ways to get experience, and there’s tons of nonprofits everywhere, so find your local nonprofit user group and see what you can do for other people,” Aaron says. For Mike, “what’s interesting is that getting involved with the community constantly changes. You have to look at where you are in the world and also in your career.” If you live in Montana there’s probably not a user group within 60 miles of you, so it might be worth it to invest some time in social. “Treat Twitter like you’re going to a party,” Mike says. You don’t go around to everyone announcing that you’re there— you spend time listening. The same goes for if you are in a position to go to a live event. Spend time listening and focus on having quality conversations, and it’ll snowball from there. “Find one person, either online or at a community group,” Mike says, and focus on building that relationship.